Nagpur: The 2nd Mini District Roller Skating Championship was organised by Nagpur District Roller Skating Association. The event was held at Vaishali Nagar skating rink in city. 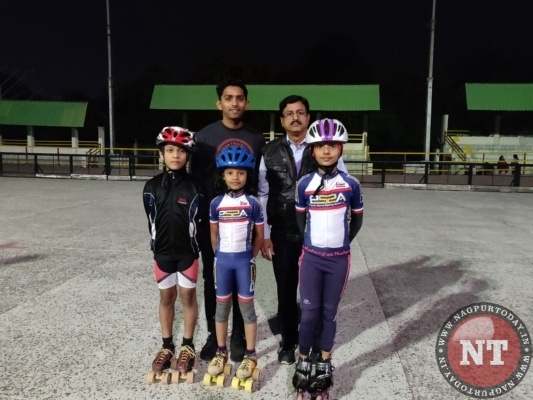 Students from Piyush Speed Skating Academy participated and brought laurels to the academy by winning 2 Gold and 2 silver medals. · Rudrakshi Gadole bagged Gold medal in 200mt. · Chinmay Borikar got Gold Medal in 400mt. · Palak Kshirsagar won 2 Silver Medals in 200mt and 400mt. Palak has been selected for State level championship to be held at Mumbai (Virar) on February 9 and 10 February, 2019. The participants were congratulated by Coach Piyush Akre and NDRSA Secretary Upendra Verma.